The heavyweight grudge match between Tyson Fury and Dereck Chisora has been rescheduled for November 22 at London's ExCel arena. The two Britons had been due to meet in a rematch in Manchester last month until Chisora fractured his hand and the long-awaited bout had to be postponed. Promoter Frank Warren said: "It's been a roller-coaster few weeks, but I'm delighted to say that the fight is definitely on with Chisora and Fury ready to clash on Saturday 22nd November at the ExCeL London. 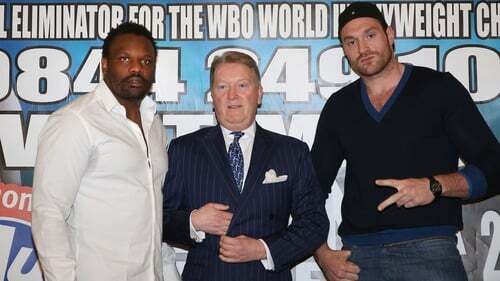 “It was an extremely unfortunate set of circumstances that caused Chisora to pull out with a fractured hand. "Despite the setbacks, they were both determined to fight each other and I believe that we could see a genuine old fashioned ring war between them." Warren had been hoping to set the world title eliminator for October but was troubled by a lack of suitable dates and venues, while also mindful of giving Chisora's hand enough time to recover. European champion Chisora, who lost on points to Fury when they met in 2011, said: "The important thing is we have a new date for the fight, it's on, and Fury and I will finally give the fans what they want to see, a fight. "What happened with my hand has happened and the timing of the injury was terrible, it couldn't have happened at a worse time and of course Fury had personal issues going on with him. "I just want to fight Fury, get revenge, beat him good and proper, and move on to fight Wladimir Klitschko for the world title." Unbeaten Fury, who had been scheduled to fight Alexander Ustinov in Manchester last month following Chisora's withdrawal but pulled out due to his uncle Hughie being taken ill, said: "Chisora is now going to get a beating twice as bad than the one that he was going to get for pulling out. "All Chisora is to me is an obstacle and I've got to smash through him to get where I want to be and that's fighting for the world title. He's messed me around and now I'm going to make him pay. I'm happy for the fans who will get to see me crush Chisora for second and final time and send him into retirement."